Douglas Carswell’s quest in Clacton to become Ukip’s first elected MP won’t now be the only by-election taking place on Thursday 9 October. 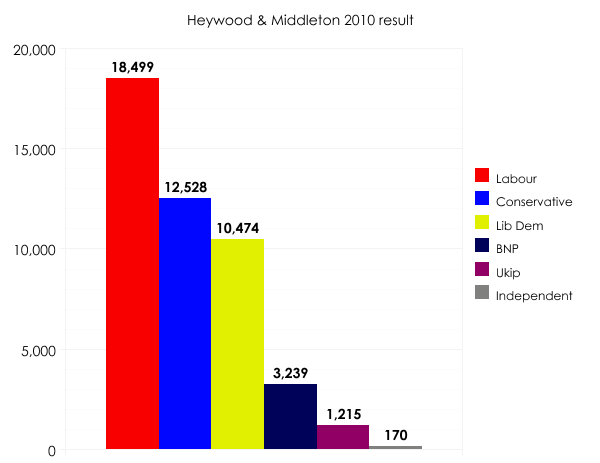 Voters in the constituency of Heywood & Middleton will also be going to the polls. They’ll be choosing a successor to Labour’s Jim Dobbin, who died last weekend at the age of 73 while on a parliamentary trip to Poland. The constituency lies within the metropolitan borough of Rochdale. At May’s local elections Labour increased its presence on the council by seven seats, gaining six from the Lib Dems and one from the Tories. Labour now has 48 of the council’s 60 seats, the Tories have 11 and the Lib Dems just one. Neither Ukip nor the BNP are represented. I imagine we’ll see a similar slump in the Lib Dems’ fortunes at the by-election. The party will almost certainly be overtaken by Ukip, ending up (at the very least) in a distant fourth place. Labour ought to benefit from the Lib Dems’ collapse, not least in helping offset any support it loses to Ukip. I think the only real uncertainty about the result is who will come second: the Tories or Ukip. I’m sure Labour’s decision to hold the by-election on the same day as the one in Clacton is not a coincidence. The party will be hoping for a quiet, orderly campaign, free of the sensation that will lapping around the Clacton race. And if Farage and co are too busy with the state of play on the Essex coast to mount a serious challenge on the edge of the Pennines, so much the better. On results night, which parts of Scotland might declare first?